As mentioned at the very beginning of this Heianjō and Go-Sanjō chapter, it appears that the Heianjō lineage is older than that of the Go-Sanjō. According to tradition, the Heianjō lineage was founded by a smith named Nagamitsu (長光) who was succeeded by Mitsunaga (光長) and Yoshinaga (吉長) until the first Heianjō master with the famous name Nagayoshi (長吉) appears on the scene. No worries, I will provide a genealogy later in this article as usual. Now I will talk about Mitsunaga very shortly because it appears that he is the earliest Heianjō master of whom blades are extant but want to share some thoughts on his predecessor, the school’s ancestor Nagamitsu. First of all, there are no blades of Nagamitsu extant. The Kotō Mei Zukushi Taizen says that he was active around Bun’ō (文応, 1260-1261) and the Kokon Kaji Mei Hayamidashi dates him around Gen’ō (元応, 1319-1321) and says that he came originally from northern Ōshū (implying that he was a Mōgusa smith), bore the name Saburō (三郎), and moved to Kyōto where he joined the Hasebe School whereupon he signed with “Hasebe Nagamitsu.” Another theory says that Nagamitsu was a descendant of the Yamato Senju’in smith with the same name who was active around Tenpuku (天福, 1233-1234). As indicated, no blade that would suggest any of those traditions is extant. Back to Mitsunaga. According to the Kotō Mei Zukushi Taizen, he was born in Kenchō one (建長, 1249) and died in Genkō three (元亨, 1323) at the age of 75. This would match with the source saying that his father was active around Bun’ō (文応, 1260-1261) but also matches the tradition that his father was a descendant of the Yamato Senju’in Nagamitsu from Tenpuku (天福, 1233-1234). 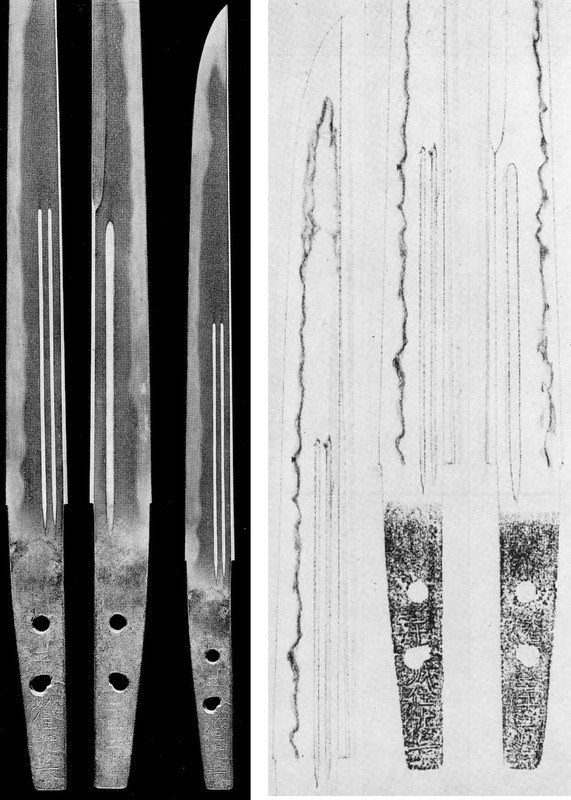 Fortunately, there is a dated blade of Mitsunaga extant, namely the jūyō-bijutsuhin tantō introduced in picture 1 which is from Genkō two (1322) and which is owned by the Kurokawa Institute of Ancient Cultures. This blade has an interesting shape. Its omote side is in hira-zukuri and its ura side in kanmuri-otoshi-zukuri. It has a mitsu-mune, some uchizori, and is otherwise of normal dimensions for that time. The kitae is a somewhat standing-out itame with ji-nie and the hamon is a nie-laden gunome-midare that is mixed with sunagashi, kinsuji, and hotsure. The bōshi is midare-komi with a rather pointed kaeri that runs back in a long fashion. Gomabashi are engraved on the omote side and the ura side shows a koshibi. The nakago is ubu, has a kirijiri, and features a relatively finely chiseled mei. Such kanmuri-otoshi shapes were very typical for Yamato blades of that time so the theory that his and his father’s roots were in Yamato sound plausible. Even the NBTHK states that this Genkō two blade reminds them in terms of tsukurikomi and interpretation of the jiba of the Yamato tradition. However, there are also Mitsunaga works extant which feature a nie-utsuri and so also another theory is possible, one that says that he was actually either an Awataguchi or a Rai smith. One of them is shown in picture 2. It is an unsigned tantō but which has a similar shape as the jūyō-bijutsuhin and which is attributed by the NBTHK to Heianjō Mitsunaga. This blade is in kanmuri-otoshi-zukuri (on both sides this time), has an iori-mune, a relatively narrow mihaba, an uchizori, a thick kasane, and only little fukura. The kitae is a very dense ko-itame that tends to nagare in places and that features ji-nie, fine chikei, and a faint nie-utsuri. The hamon is a narrow and shallow ko-nieladen notare-chō with a wide and bright nioiguchi that is mixed with ko-gunome and plenty of kinsuji. the bōshi is sugu with a ko-maru-kaeri. There is a koshi-bi wie soebi on both sides which run as kaki-nagashi into the tang and the nakago is almost ubu (it is slightly machi-okuri), has a shallow kurijiri, and katte-sagari yasurime. Whilst the first two blades were more on the Yamato side, blade number 3 shown below rather tends towards the Rai School. It is a small hira-zukuri tanto with a nagasa of 21.1 cm, uchizori, and a relatively slender mihaba. its kitae is a dense ko-itame with ji-nie and a nie-utsuri and its hamon is a nie-laden hoso-suguha-chō that is mixed with ko-gunome, notsure, and sunagashi. The bōshi is only slightly undulating, featuring a ko-maru-kaeri with hakikake that runs back in a long fashion. On the omote side we see a suken and on the ura side gomabashi. The tang is a little bit suriage, has a shallow kurijiri, and katte-sagari-yasurime. At this point, I want to give you an idea of how complicated and interwoven the topic of these old smiths is. The Ōseki Shō from the early 1500s says for example that Mitsunaga’s gō was Konyū (虎熊) and the genealogy of the shintō-era Chikuzen-Nobukuni smiths (compiled in 1601) states that the second generation Nobukuni, one of their ancestors, used that gō too. This is interesting but could also just be a coincidence. The Kotō Mei Zukushi Taizen and Tsuneishi however say that Mitsunaga’s gō was Chonyū/Inyū (猪熊). Those who follow my blog very closely might remember these characters. Read in the Japanese way, Inokuma, we arrive at the place where the Hasebe School had settled in Kyōto (more info here). Very interesting, isn’t it, as one tradition says that Mitsunaga’s father was a Hasebe smith. But there is more. As mentioned in the linked article from 2013, there is the theory that the founder of the Hasebe School himself, Kunishige (国重), was a Yamato Senju’in smith who settled in Kyōto via a stopover in Kamakura where he learned the Sōshū tradition. Now this theory is of course not settled and we will probably never now for sure what was really going on 700 years ago but I take the liberty to throw out some possible scenarios now and then. In this context, let’s take a look at the signature of the Heianjō smiths. As stated above, they signed with the prefix “Heianjō-jū.” This by itself is nothing special as it just means “resident of Kyōto,” that is, although uncommon for these schools, it would have been theoretically possible that even an Awataguchi or a Rai smith had signed with “Heianjō-jū.” However, the term Heianjō (平安城) comes with some contextual baggage so to speak. It was introduced, with Heiankyō (平安京), to distinguish the new Kyōto capital from the old one in Nara, which was Heijōkyō (平城京). Well, that move of the capital had been taken place 500 years before the Heianjō School emerged but taking into consideration (often deliberate) subtleties in Japanese language, it is possible that signing with this prefix was a way for former Yamato smiths to proudly state that they were now working in Kyōto, an issue that Sanjō, Gojō, Awataguchi and Rai smiths didn’t have to worry about as they were old-established Kyōto smiths. Incidentally, there is the old tradition that some Yamato smiths had their origins within the Iruka group (入鹿) of Kii province which in turn is said to have been founded by Mōgusa smiths in 10th century. So from that point of view, the Kokon Kaji Mei Hayamidashi is not totally off stating that the ancestor of the Heianjō lineage has northern Mōgusa roots in the wider sense. Below I want to present the genealogy of the Heianjō School as I see it today. The Nagayoshi lineage will be the subject of the next chapter. Somewhat odd is that it appears that there are no blades of Mitsunaga’s son and (the first generation) Nagayoshi’s father Yoshinaga extant. At least I wasn’t able to find one… The Kokon Mei Zukushi might provide a hint for why Yoshinaga blades are virtually non-existent. In their genealogy namely his place is left blank and filled with the information “daughter of Mitsunaga.” This would mean that Yoshinaga was Mitsunaga’s son-in-law, what leads to a range of possible scenarios. Maybe Mitsunaga’s first born child was a girl and he waited in vain for being blessed with a male heir and as time went on and on, he eventually married his daughter to Yoshinaga to pass on his profession as a swordsmith. So maybe Yoshinaga came to the family relatively late. Well, there was according to tradition also the son Sadaie (定家) (see genealogy) but it is possible that after marrying his daughter to Yoshinaga, Mitsunaga’s wife did give birth to a boy eventually. Or Sadaie was adopted as another possible candidate to take over the lineage. It is interesting that the Kokon Mei Zukushi lists a Nagayoshi after Sadaie and one after the Mitsunaga’s daughter. Possible that there was some confusion going on after Mitsunaga died and it was decided that both Yoshinaga and Sadaie’s sons were allowed to continue with the Nagayoshi name, like as it was the case later with the two Echizen Yasutsugu lineages. Anyway, that’s just some thoughts on the early Heianjō smiths and the Nagayoshi lineage will be dealt with in the next chapter.